If your blog is a fashion, wallpaper or photo blog then this is definitely going to help you because it displays a thumbnail grid style layout view. 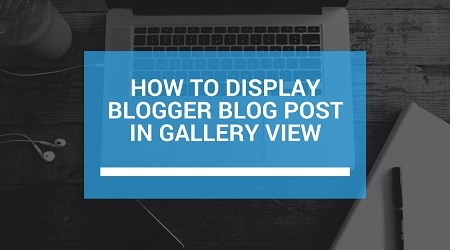 So, here’s how you can add the gallery (grid) view for your Blogger blog. 1. Login to your Blogger blog and select Template, then click on Edit HTML. </head> tag in the search box and press Enter to find the tag. </head> tag and save your template by clicking the Save button. 4. Copy and paste the code and click Save. View your blog, you must have got an amazing gallery view Blogger home page. Kindly note: If you find too much space below your post then you can modify the space height value by changing 150 value which has been highlighted in the script. thank you so much, this I looking for. so it must be in jquery? is there another way without jquery? anyway thanks again for share. the code.